Good writing is hard to come by, so what we do with recruits at my workplace is to teach them to write well. Being a former journalist and being one who writes moderately well, the task fell on Unspun to conduct the class. Being a firm believer that writing is a reflection of your mental processes, I’ve always started the course with Critical Thinking 101 and the first slide in this presentation asks the participants to tell me which of the two images is a more accurate depiction of Christ. To Unspun the comparion is a no brainer. Jesus was a Jew and a middle easterner, a native of Galilee. People like that, as in the BBC reconstruction from a skull found there during the period of Jesus, tended to look like the chap on the right. He may not looked exactly like the man portrayed but for sure he would have been swarthy and would NIT look like an Anglo-Saxon savior right out of the paintings of Byzantine artists. Inevitably, however, there would be one or two – sometimes more – participants in the class who said that Jesus would have looked like the person on the left. The reason? That’s the image of Jesus they’ve seen growing up and the image that adorns the churches they go to. Which was perfect for us to begin our discourse on critical thinking, the importance of not accepting anything at face value and why we need to ask questions more. Inevitably too, someone would raise the argument that too much critical thinking is bad for us because it makes us cynical. We should just accept things based on faith. The answer is that too much of anything is not good for anyone. At any rate critical thinking, if practiced skillfully leads one not to cynicism but to skepticism, which is not a bad thing. In this world, if we question more without becoming cynical (which Oscar Wilde defines as “knowing the price of everything and the value of nothing”) we’d be enjoying oour lives more, not less; and socially and politically we would be ensuring that much of the ugliness and hate in this world we see today would be minimized. Friends and acquaintances who are so talented and must have accomplished so much and shown such promise that they have been singled out time and again to receive one plush fellowship or another. You know them. They are the ones that pop up in your timeline proclaiming they feel so “humbled” to be selected for such fellowships, then proceed to bombard you with photos of the hallowed halls of influence and scholarship they’ve been sent to and the beautiful super smart people they’ve met. At first we feel very happy for them, to be recognised for their contributions and being sent out on fellowships so they may learn of developments in their field by others in other countries. Presumably, this would open their eyes give them new insights with which to come home and put new ideas into practice for the benefit of recipients of their cause. So we like their posts when they so generously share on social media the great times they had and the illustrious people they meet. Then they come home and before you know it, they are on yet another fellowship again. And again with barely a year’s hiatus in between. About the institutions dishing out these fellowships. Is Indonesia so thin on talent and worthy people that the same people keep being selected all the time? About the recipients themselves. Where do they find time to put their new learnings and insights to work if they are busy going form one fellowship to the next? Unspun recently had conversations with his friends and and we tried to analyse what these recipients do after their initial spurt of productivity that saw them establishing causes, movements and organisations for the public good. Out conclusion was that we couldn’t see how their fellowships had benefitted their causes. In fact, in some instances, we felt that their causes had suffered from neglect because their founders/main movers were too busy traveling father fellowships. We counted a couple of serial fellows who must have gone on three or four fellowships over the past five years. There comes a point in life when anything, even the best intentioned ones involving very talented people, become ridiculous. Unspun thinks its the best idea since tempe but then again, he’s biased to the PR profession. But JWT has taken a huge step in appointing former Ogilvy PR and Pulse boss Marianne Adamardatine to head its operations in Indonesia, that includes digital agency Mirium. If it works it will open the doors to lots of PR professionals and possibly usher in a new way of communicating not dominated by the advertising mindset. If it fails, the I-told-you-so guys will have a field day. Will it work or won’t it? What do communicators out there think? These are interesting times for the marketing communications industry and for public relations. Like all companies in this area, JWT have been experimenting with how to cope with disruption and media convergence. Their answer is an interesting one in Indonesia: appoint a Public Relations professional to head their team in the country. Campaign has reported that JWT has appointed Marianne Adamardatine, who has led Ogilvy PR and Pulse for many years, and who was recently appointed by Ogilvy to be their Chief Growth Officer, to head JWT indonesia. She “will be responsible for expanding the company’s capabilities in strategic brand building, digital transformation, customer experience, marketing automation and commerce activation, as well as driving thought leadership and building business engagement with C-suite clients to initiate integrated campaigns,” according to the company. This means she will oversee the advertising and digital operations, Mirium. 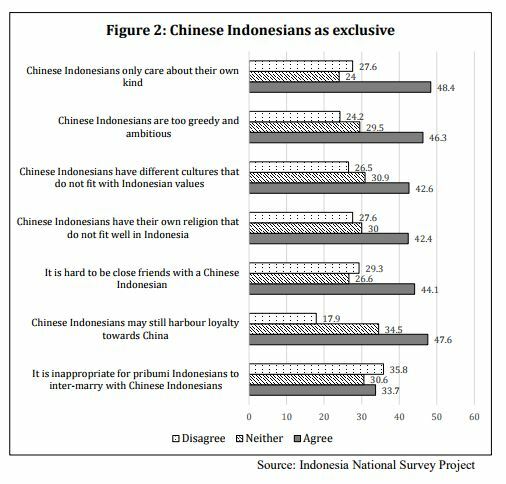 What do pribumi Indonesians think about their Chinese counterparts? If the survey is accurate it suggests that after decades of living cheek by jowl with the pribumis, they still harbor stereotyped perceptions about the Indonesian Chinese. Among the most glaring stereotyped are that the Chinese Indonesians tend to be more wealthy than the pribumis. Over 60 percent of respondents in the survey felt this. Astoundingly almost half of the respondents, 47.6 percent, believe that the Indonesian Chinese harbor divided loyalties between Indonesia and China. The survey, which was conducted in May 2016 after the anti-Ahok protests, did not say whether these sentiments were as intense before the demonstrations. Does this mean that no Chinese Indonesian can ever stand for high office and win, because all the opposition has to do is to fan the racial flames? Can pribumis be so oblivious of the many, many walthy-off Pribumi officials and businesspersons that are so visible in everyday Indonesia? Does it mean that Indonesian Chinese should prepare for a difficult year ahead and until the 2019 presidential elections are over before letting out their breath? Will Indonesia be a racial powder keg all primed? Should Indonesian Chinese try harder to disabuse their pribumi counterparts of their prejudices? Or are they better off letting things lie than run the risk of stirring things up? The would the results of a similar survey, if conducted in neighboring Malaysia, show a lower, similar or higher level of prejudice?